My personal retirement accounts are a little bit of a jumble. I've got a Roth IRA, a 401k at my employer and another retirement account that my employer manages. The funds are split about 2/3 in the employer managed account and 1/6 in each of the Roth and 401k. I've got a mix of assets in the different accounts. The employer ran fund has a mix of stocks, foreign, bonds and other investments that the retirement program manages. Its kind of like an all in one fund. The money is in that fund by default though I should really start to move it to other funds. My 401k is generally split between a general stock index fund and a broad bond fund about 50/50. The Roth is mostly index funds with a dividend emphasis and a handful of individual stocks left over from my stock picking days. Its not looking too bad really. The individual stocks are just whatever stuff left in my Roth IRA from when I was picking individual stocks more. As its just ~1% of my total I"m not too concerned with it. I've got some BPT I should liquidate next time oil goes up in value and some HPT that seems to be doing fair enough so I havent' got a plan to sell that. 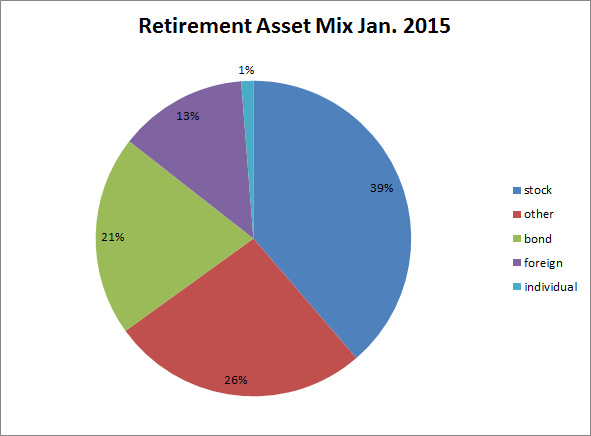 The "other" category is whatever assets my employers retirement plan has that don't fall into the other categories. Seems a mix of stuff like hedge funds and commodities. I'd generally prefer to get out of that stuff as I don't know much about what it is and I'd prefer simple stock & bond mix. I'd probably like to get the whole mix to something like more like 40% domestic stocks, 40% bonds and 20% foreign funds. Or maybe 50% total stock funds and 50% bonds. Other than my retirement accounts we have other assets in : my wifes retirement accounts that she manages, rental real estate and cash. The mix is roughly 40% rentals, 30% retirement, 20% house and 10% cash. We're pretty heavily invested in real estate as you can see.